a spot of whimsy: My Switch to Feedly. If you are a committed Google Reader user (like I was), you were likely pretty frustrated/sad/devastated when Google announced a few months ago that it would be retiring the service on July 1, 2013. After looking into a few different replacement readers, I decided to move on over to Feedly, which I've been using for about 3 weeks now. Quick aside before I show you around Feedly, don't know what a "reader" is? It is life-changing, for good and bad. It allows you to add any website with a feed (simplified definition - a stream of updated content, like blogs and most news sites), so that you do not need to go to each individual website every day and see if there is a new post. Instead, the updates show up in the reader, so you never miss a thing. But, the ease of keeping up with multiple sites makes you less discriminating in what you add to your reader, and you can get overwhelmed quickly. So word of advice if you become a reader addict: weed out, early and often! Oh did they ever make it easy for us Google Reader users! Go to feedly.com, then click on that "Connect to Google Reader" button. Login to your Google account. Follow the instructions and prompts. Allow Feedly to access your Google Reader account. And ta da, all your Google Reader subscriptions are now transferred into your Feedly account! My favorite part of Feedly so far may be its app on the iPhone and iPad (you can download for free). It has such a clean display, both as an app and on a regular computer. And I love the "Save for Later" function for videos or long articles that I can't read right away. There are, of course, a couple of downsides: (1) Feedly does not yet have the same search functions that Google Reader had, though they are working on it; and (2) all formatting is completely taken away from a blog post: fonts, colors, and, my biggest pet peeve, the sizing of pictures (which I spend a lot of time making consistent around here), are all removed when you view through Feedly. And if you never had Google Reader? 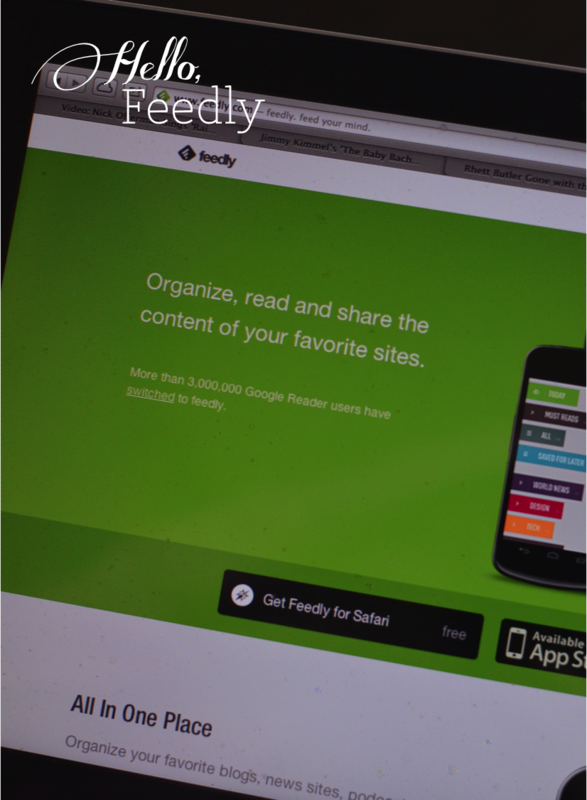 Just create a Feedly account and begin adding your favorite blogs and news sites. To do that, when you're logged in, there are 3 little horizontal lines in the top left corner. When you hover over it, a menu pops up. The 3rd option down is "+ Add Content." Click on it, and then you'll be able to type in the feed you wish to add. For example, type either "aspotofwhimsy.com" or "aspotofwhimsy.blogspot.com," and then click the "+" to the right of it to add to my little blog to your account. What have you been trying out as Google Reader comes to an end? Any tips or suggestions? Has anyone else tried and liked Feedly? And let me know if there are any questions about the service as well. I just made the switch from Google Reader (sigh) to Feedly this week. My one major complaint: how can I organize/access content organized by blog, rather than category? When I click on, say, "style" I get a feed of all my style blogs in chronological order. As a result, I realize that I dislike switching between the voice of the different blogs that I follow when I'm trying to catch up on y'alls content. you know what I mean? any solutions out there?